Review by AllTheBestFights.com: 2015-07-15, great performance by both fighters: Manny Gamburyan vs Scott Jorgensen gets three stars. The black belt in judo and karate Manny Gamburyan entered this fight with a professional mma record of 14-8-0 (64% finishing rate) and he is ranked as the No.10 bantamweight in the world (currently the #1 in this division is TJ Dillashaw). He fought twice last year losing to Nik Lentz and winning over Cody Gibson. His opponent, Scott Jorgensen, has a record of 15-10-0 (47% finishing rate) and he entered as the No.28 flyweight but he won just one out of his last five bouts, against Danny Martinez; after this fight he was defeated by Wilson Reis. 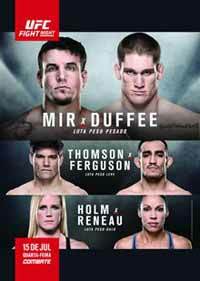 Gamburyan vs Jorgensen is on the undercard of Frank Mir vs Todd Duffee – UFC Fight Night 71. Watch the video and rate this fight!